I had the pleasure of speaking with Bridgett McGowen an awarded international public speaker and the founder of public speaking coaching firm, BMcTALKS, LLC. She works with clients on improving their communication skills to engage and connect with their audiences, and her goal is to help people use their voices to undeniably stand out as leaders. Bridgett has designed and facilitated for national and international audiences hundreds of high-impact webinars, and has been selected to speak at conferences alongside notable figures including Former President Barack Obama, Oprah Winfrey and Senate Majority Leader Dr. Bill Frist to name a few. Want to Connect with Bridgett? JM: Hi, Bridgett. How are you? BM: I am doing fantastically well. How are you, Jenn? JM: I’m great. I’m super excited to talk with you. You and I were connected by a mutual friend, another professional woman whom I admire and love. I have come to find that when Jodi connects me with people, they are also great people. Of course, I just completely fall in love with you. I think you’re so awesome. I’m excited to share more about what you do because I have found your services, this is not a promotion at all, this is just me saying I think you’re awesome, but I have experienced some of your services so tell us a little bit about what you do. BM: First off, thanks a ton for the incredible endorsement and being incredible, just being awesome, being your awesome self, Jenn. BM: Yeah. So a little bit about what I do is half of my time I am a professional speaker. I am an international speaker. One of those motivational-type people think, keynote addresses think, commencement addresses, those lunch and learn professional developments, I’m that speaker at the front of the room, however your typical speaker is the person that you tune out, you catch up on email, I’m not that person, Jenn. JM: I know this about you. Tell us a little bit about how you help other speakers. BM: This is the part that gets me really, really excited. I love the presentations, I’m telling you. I’m just having my own little party up there with the microphone when I’m on a stage but the other part of my time when I’m not on a stage, I’ll tell you is incredible. I get the privilege of spending time coaching professional women on presentation skill, I mean the money it costs companies, and the time it costs companies over the years when people are not ready and not excited, I don’t know how to get rid of the anxiety and get on a stage and rock it out, is unbelievable. Depending on the size of the company, it can be hundreds of thousands of dollars if not into the million wasted on – I don’t like the word wasted – but hundreds of dollars, millions of dollars in resources that are consumed because of people who are not comfortable with only me on stage. I get to spend time with ladies who want to master their messages and rock the mic. That’s what I do when I’m not presenting myself with that presentation skill coaching. JM: I love that. I was excited to talk with you because I feel like really developing those speaking skills. I get what you’re saying, it’s harsh to say that the money is wasted but certainly there are a lot of I think professionals on an individual level but also corporations who are investing in their employees who don’t see the return on investment that they might otherwise if they had a really commanding, compelling polished speaker up on the stage, how did you get into doing this kind of work? BM: It started back in the elementary school, Jenn. Every report card period I receive in the teacher comments area talks too much. JM: We would have been friends in school, we would have gotten in trouble together. They would have separated us into different classes. JM: They weren’t strangers for long. BM: Since 2002 I have been a professional speaker and I’ve made hundreds of presentations all across the country all around the globe. I started by teaching for a community college system in the Houston Texas area. I also talked with the University System that I’ve taught online. But prior to launching BMcTALKS, LLC, my public speaking firm, and after leaving the teaching world, I completely believe in the physical classroom in Texas. I relocated to the Phoenix area and I became a Faculty Development Consultant. In short, all that meant was, and this was the tagline I use with people, I teach professors how to teach. I travel the country, I made stops in over thirty states, one United States territory, multiple countries where I facilitated professional presentations. I helped faculty members at colleges, universities, and technical schools understand what does it mean to have this 21st-century student in your classroom and how do you teach and effectively engage three different generations in the classroom. JM: And make money on it and do it better. That’s awesome. JM: What year did just start your business? BM: I started my business in 2016. JM: Okay, got it. I have known you for a little while now and some of the things that we had talked about are how difficult it can be when starting a business. I think a lot of listeners can relate, either they’ve started their business and they’ve experienced this or they are going through it now as they go through that startup phase. But something you and I have talked about was the struggle that you had in terms of feeling like you needed to create something unique or have a unique message and that it was a frustration for you. Talk to me a little bit about that time when you’re starting your business in that frustration. How did you deal with that? BM: Jenn, you said this with me painless. JM: There has to be a little pain. BM: If this is kind of like going into the gym and feeling the burn. JM: Yes, you’re going to feel so much better later. JM: This is your time. I love this though, this is why this was important, in seriousness, this is why it’s important to talk about this topic because so many women entrepreneurs feel this way. In fact, one of our recent dinner events that you were able to attend, one of the things that we talked about was how there are no new messages, there are only new messengers. That really hit home for me like I love that quote. I’ve looked it up and I can’t find anyone to attribute it to so if anybody knows, feel free to hop on to my Facebook and let me know who said that. But it was such a great quote because as women entrepreneurs, we suffer from imposter syndrome, we don’t believe we’re good enough, we think somebody else has been doing it for longer or is better at it. We kind of have all these mind games that we play with ourselves but the reality is you are unlike anyone else and it’s not so much about being something that is brand new. There’s really nothing new. There is seeing through your eyes which is completely different from anyone else. BM: That’s killer, Jenn. I know it sounds cliche if you’re listening to this and you’re rolling your eyes and you say, “I’ve heard this before. This is same old same old this you and unique thing, or what have you,” I’m telling you, you must embrace that and nobody can give a message as you give it, know that nobody can make it happen like you make it happen. You give people no perspective that they never thought of, you give people fresh points of view that they never even realized could be possible. You have to decide that, you will know whom to attribute this one to, you’re ready for it, you put the you in unique. You like that? JM: Was that you? I think that was you, right? I think you’re the other on that one. Let’s talk a little bit around where you started with your business because I know that was kind of another thing that was frustrating that I think that you can share your perspective and kind of help other people who might be going through that startup phase. Because it can be tough especially when you have maybe a limited experience, resources, funds, and time sometimes if somebody is working at a job while trying to launch a business. But what was going on for you around that time in your business and how did you figure out finally where to begin to get your business launched? BM: I’m going to answer that last question first, “how did you finally begin or how did you figure it out” You move. That’s what I did. I didn’t sit still. It was easy to sit still and say, “My goodness, where do I go? What do I do? Do I need a website? Do I build it myself? Do I hire someone to build it? Do I hire a PR firm to promote me? Do I speak for free?” The questions run but I had to say, “Bridgett, stop asking a bunch of questions and get to answering at least one of them by moving, talking with other people who are similarly situated, but more importantly, who were similarly situated but has been successful,” people like you, people like Jodi who you mentioned at the top of the recording, people like that and understanding when is the time to get help. You cannot do everything and you want to know something, the smartest business owners out there know that they cannot do everything and more importantly that they should not. JM: Right, I totally agree. BM: It’s like a jack of all trades, master of none, something along those lines. JM: Absolutely. We say that all the time when we’re working with clients where somebody is trying, I’m over resourcefulness, absolutely, especially when you have a small business or if you’re still in startup phase which I totally get but I think that established entrepreneurs really understand that you stick to what you are good at and you really capitalize upon your expertise and then you leverage the expertise of others. I remember I shattered to think, I’m like self-taught on WordPress and some other software platforms that are now changing so much but some of those things are a necessity. But then things like bookkeeping, payroll, I think whoever you are, you have the strength that you do leverage but you absolutely should be asking for help from other people so I think that’s really a great piece of advice. BM: And when you do so it frees you up to do that which you absolutely love, that you were made to do. Don’t wait for the perfect moment. I’m telling everybody right now, don’t wait for the perfect moment or for everything to be perfectly in place. That is not going to happen. JM: It’s just going to hell again. That’s being an entrepreneur, it’s like you’re on top of the world and then something happens. But yes, don’t wait for the perfect moment because it comes and it goes and you will miss out. BM: Yeah, and I’m going to tell you, Jenn, I’ve been in WordPress hell with you, I’ve been in Weebly hell like 11:00 at night gnashing your teeth. JM: I know, trying to figure out HTML, that I miss closing a bracket. JM: Let’s switch gears a little bit. I think that there are a lot of people who are fearful of speaking or maybe they don’t really truly get the value of what it is to become a polished speaker. I think all of us can name a handful of speakers who maybe are not the most polished but they are very passionate and so they end up being successful. But I personally feel like you do that having really well-honed speaking skills will really further your career and further you as an entrepreneur. It’s interesting because a lot of our clients start with a corporate brand but then they decide they want to spin off into a personal brand. Typically with personal branding, we’re talking about how we’re going to promote this person and build their reputation as a speaker, a coach, an author, you have to have great speaking skills. Talk to us a little bit about why those speaking skills are so important. BM: When you go out, you’re not just representing a company, whether it’s your own company or if it’s a company of which you are employed, you’re also representing yourself. My goodness, you can garner the attention, you can move people like no other if you have a command of your presence and a command of your message. In school or at least where I grew up, we learned if you could read, if you could write fairly well, and if you could speak and speak effectively, articulately with thought, care, and passion, my goodness! The places you could go. I use my goodness too much but it’s just how I feel. It’s my thing, my goodness is my thing. But it’s so incredibly important because when you are able to articulate how you feel, what you do, why you do it, why you love it, and you are able to get audiences on board and bend ears, then your dream becomes reality and your success becomes unstoppable. I firmly believe that, Jenn, when you are able to master your message and rock a mic and get in front of an audience and do your thing without even missing a step, it’s killer. JM: I absolutely love that and we’ve all been in the presence of those speakers that we feel like we’re really there with them at that moment. I think that’s what most speakers really aspire too. How do we get to that point? What advice would you have? I mean, if somebody’s a new speaker, if you’re new to speaking, it’s probably a no-brainer that they would want to talk to somebody like you or that you’d have advice for them. But do you have advice for people who are new to speaking and maybe those who are more seasoned speakers? BM: I have a long answer, make sure your comfortable. JM: Alright, I’ll get comfortable. BM: If you’re tired of looking at videos, reading books, listening to other people make presentations, and your presentations skills are not where you want them to be, then you should look at doing something differently, whether it’s investing in a coach, really working on your skills, taking out time to take a course. If you’ve tried all the techniques you heard in speech class back in college, or elsewhere, or from other presenters and none of it is feeling right, none of it is working for you, then it’s time to do something differently. Somebody who’s new to making presentations, I want to tell you that you have to remember, the audience is not sitting there hoping you’re going to crash and burn. The thing is nobody wants to see fall on your face. Now let me talk for a minute because I am a realist, Jenn, you know there are some people in an audience who are just cranky. They don’t have a happy thought from sun up to sun down, they aren’t all sunshine and puppies and rainbows. JM: I don’t get it but I know those people like this. BM: Actually, you feel bad for them but the thing is, as a new presenter, you cannot let that bother you. You know that the audience is there cheering you on. Those people, they have their own issues through which they need to work. JM: What advice do you have for that? Because I have experienced that. It’s interesting what you say because I agree, I think there are those times where I’ve been in an audience with a speaker who is obviously really nervous or fumbling or forgetting something and energetically, I’m cheering them on because their comfort, composure, and ability to share their message in a relaxed and enjoyable way is enjoyable for me. JM: I love that. It’s compassion. It’s like when you’re dealing with any person who’s maybe disconnected, brood, or having a bad day, it’s having compassion for that person’s coming from instead of letting it be about you. JM: I love that. That’s great advice. And what about if somebody is a more experienced speaker, what advice do you have, like what are some of the common things that you tend to see people need to work on even if they are a seasoned presenter or what advice would you have for those folks? BM: Right. The advice I have for them is to make sure you have fun. When you do something time after time after time after time, you can get into a rot, you can start to get bored with it possibly, or if you do the same presentation over and over again, you may start to lose excitement and the joy. Remember to have fun, you’ve gotten down the basics, you know your business, you know your profession, you can do your job in your sleep, “Hey, let’s do this after,” you’re a genius. So what you have to do at this point is to have fun because you’re not at a point where you’re threatened and worried about technology or worried about the audience liking you. If you’re enjoying this, you got this, laugh at yourself, be a rock star for your audiences, endeavor to change lives to ignite passion, to be a change agent, be the inspiration you wish everyone else was when they, when he or she talked to the microphone, that’s what you want to do. JM: I love that. It’s such good advice. No wonder you’re a motivational speaker. I’m like, “Damn, I want to endeavor to be the inspiration. I’m ready, I’m ready, Bridgett.” You and I had talked a little bit about beforehand but you have a number one strategy, kind of a number one go to secret, lay it on me. BM: I’m telling you, Jenn, I’m telling you I don’t tell this to many people, my number one strategy – and I don’t know when I picked this up but I realized it after several years and I don’t know how many presentations – my best strategy is to never let them see you sweat. It doesn’t matter if the audience does not like you, if you do not like the audience, that happens, if you are tired at all, get out, if you have gotten some of the most earth-shattering news right before a presentation, that’s happened to me. If you got lost while you’re trying to find the place, technology failed, a slide is missing, your video does not play, an activity is being the flop, you lose your train of thought, I can go down the list of anything-goes-wrong. What I want you to do is smile and make it clear that everything is alright and see your audience is going to love you. If you’re looking frazzled, if you’re looking anything less than put together, happy to be there, looking like you’re having the time of your life that everything is absolutely fun, then the audience is going to wonder, “What’s going on here?” I don’t know. I’m not having any confidence here. You have to show that there is nowhere else you’d rather be, nothing else you’d rather be doing than spending time right here, right now with the people gathered in front of you. That is my biggest strategy and the best strategy I’ve ever put in place is to never let them see you sweat. JM: I love that. It’s so good. But I have to tell you that whole list of things that you just went through make me feel so stressed out like I’m sitting here feeling so stressed out, your phone doesn’t show up, you’re missing a slide, you look crazy, you had a bad day. Some of those things have happened to me too, getting there like cutting a little bit too close, getting there because I got lost, or there was a problem, I mean those things totally come up and it’s so hard to get recentered again when those things happen. So how do you keep the sweat in check? Like how do you get that back under control when inside you are really feeling like, “Oh, my God, this is just the wheels are falling off but let me show up and let everybody know that there’s nowhere else I’d rather be, there is nobody else I’d rather be spending my time with,” how do you do that? BM: Jenn, that’s a really, really good question. I have a fantastic answer for it. Of course, all of your questions are really good, I mean if they weren’t you, it wouldn’t be good. This is what you have to do, it’s all about mindset, Jenn, it’s all about mindset. You have to look at the bigger picture. This is a question you must ask yourself no matter what’s happening, no matter how frazzled I feel, how upset I am, how I’m not being all right now, I have an option, this is question I must ask myself, I have an option, do I want to be remembered for being frazzled all over the place, flustered, disorganized, just amissed? Do I want to be remembered for that or do I want to be remembered for being a polished, put together professional? For which do I want to be remembered? Mindset, I have to look at the bigger picture. I am here to make a difference and I cannot make a difference by caring about taking the wrong exit off the freeway. I can’t make a difference by getting consumed over the laptop not talking to the LCD projector or whatever the case may be. I’m not going to make an impact, I’ll make an impact but it’s not the kind that the audience really needs from me. That’s not what they need from you by now. Yes, it is hard, it’s hard, it’s mindset, the question you ask, for what do I want to be remembered? JM: I love that. Two things come up for me when I hear you give that advice, the first is I actually had that experience where my slides didn’t work, like nothing worked. In my early days, there’s a presenter I would rely on my slides to know what to talk about. It sucked and it was awful and I never wanted to do it again. Then I did it again and it was fine. But those are the things that really I think separate the woman from the girls when it comes to presenting because those things are going to happen, they’re going to happen, I don’t care how prepared you are, how long you’re a speaker, those things are absolutely going to happen and if you can roll with it and then keep going, get back up on the horse, you become a better presenter for it. I learned a very good lesson that day and that is be prepared with something besides slides. So I learned that lesson and I got through it and I did it. I did it anyway and I got through it. The other thing that comes to mind for me is I used to have a really hard time meditating and I kind of bought into that like, “Oh, I’m just not a meditation person. I can’t meditate. Everybody is different.” But I finally just kept trying and trying and it has become one of the best things that I have ever done for myself in really all aspects of my life but especially when it comes to presenting. Anytime before I record a podcast, before I meet with a client, before I present, I am meditating. I’m at least sitting in my car for two minutes, sitting in a green room for two minutes. Whatever I’m doing before I do an interview or an appearance, I sit for a minimum of two minutes and give myself that time to just collect myself. It’s not even collecting thoughts for me, it’s really about getting centered and I think especially when you’re talking about getting into that mindset and being in that place, part of being a great presenter is being a leader and a leader can stand up at the front of the room and make it okay for everyone, “I’m going to make this a great experience for all of us, I am going to lead you through, I’m going to make it okay for all of us, I’m going to give you that experience,” and part of that is being centered so I’ll get off my soapbox. But meditation, I personally think, has been a key for me as a presenter, but absolutely getting into that mindset. BM: No, no, no, it’s fantastic. I mean you make me think about the word facilitate and that’s what you are at the front of that room is a facilitator. To facilitate means to make something easy. As I facilitate, you are supposed to make this an easy experience for everyone. You are the one who is setting the tone, creating the ambiance, and giving the audience the kind of feeling it needs to have. You’re supposed to make it easy. In terms of the meditation, you said that you meditate before podcasting, two minutes and so I’m sure you did about twenty minutes today before talking with me. JM: I had to get ready, I had to get ready for this one. You’re so funny. So tell me I know you are just a wealth of information and experience and expertise from all of your career and starting your own business but talk to me about some of your top tips for women entrepreneurs. BM: Yes, my goodness, this first one is born when, I don’t know, sometimes I get pushed back especially when I start talking specific about it. But my first tip is always look and sound the part. When people see you, you want them to know you are in command of yourself, your business, and your message. Then when they hear you, make sure you leave no doubt in anyone’s mind that you are at the top of your game. Get your head up, those shoulders back, those eyes a laser-focused, always look and sound the part. JM: Why do you get pushed back on that one? BM: It’s when I get into some very specific details. I’m not going to tell them here but I get into some very specific details in terms of looking the part. I have a very strong opinion when it comes to looking the part and making sure that you are able to stand out in the right way. JM: So is that in the dashboard for your class that I just enrolled for because I’m going to have to go in there and take a look at that. JM: That sounds like a very important piece that we need to know about. What else? So looking and sounding the part which I totally agree with, and by the way, I think looking the part is whatever makes you feel good. I have talked with a lot of women from a lot of industries in Catalyst Conversations, the podcast, about what it means to look the part and feeling this pressure to feel very commercial these days and I don’t think that’s it, I think it’s whatever makes you feel good because you make your audience feel good so I think that’s a great tip is looking and sounding the part. What else? BM: And it depends on your industry too. There are some industries where it just makes sense to wear a certain thing to look a certain way. If I’m going to be a personal trainer, well, I don’t need to show up in a Tahari suit, so it depends on your industry as well. The second tip that I have is always aim to make other people better to uplift others constantly. Believe that you are in front of the most important person in the room and I want you to stay in and speak to each person that comes before you as if he is the most interesting, she is the most exciting, most important person in your meet. I’m talking about leaning in, cheering, and embracing every single word that person says. Then what happens is when you put the focus on other people, it makes them still incredibly important, you are the one who ends up looking pretty good on yourself. JM: I love that. That is great advice, that’s very good advice. What else? JM: So not my husband. He’d let me know when I’m wrong. It’s an agreement we have with each other. So someone who will side with you no matter what. BM: It’s not like he might be the third person, the second person. JM: We’ll get there, we will get there. BM: The person who’s going to guide you and insist on you being your absolute best, no excuses, your absolute best. You must shine. Then your third person is going to be that person who’s just going to kick you in the rear and say, “Get it together, pull it together. Do what you gotta do, make it happen.” Those are the three people that I think you should have in your circle. JM: That’s great advice. We talk a lot, it’s interesting in Catalyst Founder’s group, we will talk regularly about the people you need on your team like you have to have a team to be successful. From my perspective, these people will include people who can give you really great professional advice so people like your CPA, your wealth advisor, now my speaking coach, Ms. Bridgett, my therapist is part of my team personally and professionally because those things are all interrelated. All those people are on my team. I have to have these people to help me be successful and I think that’s an element that we need to add, those people who are on your side no matter what even when you are wrong because you need those people to uplift you. The person who insists on you being your best self and the person who will, I love this, kick you in the rear when you need it. I love that, I think that’s great advice for people you need to have in your circle. I love that. BM: Yeah, funny, when I heard it, I just thought it was such a solid way to identify who are the people that you need to have around you. With social media and everything else going around us, the business networks that we create in our physical settings and so on, it gets sometimes overwhelming to have so many connections and to have so many people in your meets but you make sure you have at least those three people, then you’ve got a solid foundation for reaching the masses, as you can see you can grow your network and continue to grow your business absolutely. JM: I love that. I think it’s important too to realize that these days, you brought up social media, but speaking in presentation skills are no longer just for the stage, video is becoming increasingly important. That’s something that we talk about with our clients on a regular basis too. They are thinking about their marketing and how they’re going to get themselves out there. Portraying yourself as somebody who is well-spoken, polished, and can pull together an articulate thought that resonates for people emotionally is hugely important in social media so it’s not just on the stage anymore, it’s really all the time, everywhere, whatever you are doing and I just know that those skills that you are teaching people are with them everywhere they go. Thank you so much. It’s been amazing talking with you. If people want to reach out to you, where can they find you? BM: Absolutely. You can find me at my website, bridgettmcgowen.com or bridgettmcgowenhawkins.com. I know it’s like, “What’s going on, Bridgett? What’s with the name?” That’s a long story, that’s another podcast. But Bridgett McGowen-Hawkins is the mouthful so the professional name is Bridgett McGowen, but the legal name is Bridgett McGowen-Hawkins. But both of those websites, you can find me there, you can also find me on Twitter @1BMcTALKS. You can find me on Facebook, you can find me on LinkedIn, let’s make sure we connect. I just like to hear what messages people are wanting to get out there and how I can help them make those messages stronger than ever so definitely visit my website. I’m going to have some pretty awesome giveaways on there soon. So make sure you visit either of those websites. JM: Perfect. 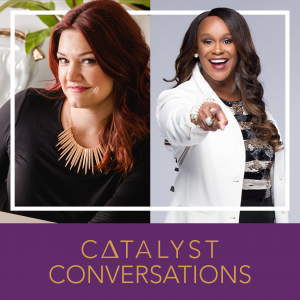 If you have trouble finding it or if you’d like to reach out to me or learn more about the Founder’s Group which we mentioned today, you can check out brandwithcatalyst.com and in the blog we’ll have the transcript from this show as well as the links for all the places that you can connect with Bridgett. Bridgett, thanks so much. It was great talking to you. BM: Likewise Thank you, Jenn.